"If all of the proven reserves of coal, oil and gas were to be burned by 2100 (2795 Gt), and at the same time the air extraction experiment of Global Thermostat were to be scaled up as Eisenberger and Chicilnisky project (withdrawing 2400 Gt), then Earth’s atmospheric parking lot would still have space for 170 more Gt before it hits the Kyoto limit of 2 degrees of warming." My beef with the whole “solutions” thing comes from my travels around the country, talking on college campuses and such; there is this whole clamor for “solutions.” The idea is, if you’re not optimistic enough, you should shut up. But there are subtexts to all these things. And the subtext to that particular meme is, “Give us the solutions that will allow us to keep running our stuff the same way we’re running it now, except by other means.” They don’t really want to hear about other arrangements. They want to keep on running all the cars, only differently. You know, like hybrid electric cars, or electric cars, or cars that run on algae secretions. But they don’t get that we’re done with that way of life. The mandates of reality are telling us something very different. They are telling us we have to inhabit the landscape and move around in it very differently in the future. Scientists grasping at geoengineering straws to maintain a quasihuman technotopia into the post-Anthropocene have proposed a lot of bad ideas but occasionally something pops up that could conceivably work. Those in the latter category need to be put to the proof. We will have a closer look at one of those, but first a quick bit of background. 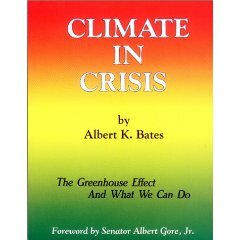 In 1989, when we were proofreading publishers’ galleys and drawing illustrations to go with our planned January 1990 release of Climate in Crisis: The Greenhouse Effect and What You Can Do, two new books came across our desk that seemed to confirm the importance of what we were writing. The two were Bill McKibben’s End of Nature and Steven Schneider’s Global Warming. The first we dismissed out of hand because it seemed overly prosaic and we did not agree with the premise — nature was not going away, although we humans well might. The second gave us greater concern because, like Climate in Crisis, it put the science out there for the average person to read in terms that were easy to comprehend, and it told a story by scientific discoveries, in a sequence not unlike our own, from ice cores to better light bulbs. With the hindsight of 31 years, we’d have to say we owe Mr. McKibben an apology — he was right and nature really is dying. Much of it is already dead. Our approach, like Schneider’s, was too cautious, too conservative, and too timid. We proposed that the “Peace Dividend” from the end of the Cold War be used to remake a clean, green, economic engine of sustainable development — a solar-powered future. Looking at that now it seems laughable: a technofetishist utopia. Back in 1989 we couldn’t really face the worst —the Venus scenario — it was too horrible. We described it, but then we went right back to light bulbs and Energy Star appliances. By now, we are in complete agreement with him on this point. Technofixes have to be seen for what they are — nostalgic longing for an extinct, Disneyesque futurism. Torus energy, biofueled airliners, Virgin Galaxy trips to the moon and desert cities encased in air-conditioned biodomes are all forlorn grasps at a tiny twig of what-might-have-been, as we plummet off the cliff face into a hellish post-Anthropocene. Our most recent book, The Biochar Solution: Carbon Farming and Climate Change, proposed a realistic and still feasible end run around the politicians and bankers by going straight for the farmers and homesteaders working to hold back the deserts. The Biochar Solution is geoengineering disguised as organic gardening. It takes two fundamental human needs — food and energy — and provides the former much more reliably in the changing landscape of the 21st century by extracting the latter in an ancient, alchemical way. Nothing is needed by way of exotic metals, crystals or fractional reserve banking, and we know it works because Christopher Columbus and Genghis Khan both used it to reshape our atmosphere and climate once before. By reforesting entire continents (albeit unintentionally, as a side-product of genocide and mass-enslavement) they each interrupted “natural” warming cycles and brought about major cooling cycles — even minor ice ages — virtually overnight. Less proven and more in the realm of exotic metals, crystals and fractional reserve banking is a strategy being proposed by a team of academics turned entrepreneurs led by Columbia University’s (no relation to the Italian navigator) Peter Eisenberger and Graciela Chicilnisky. 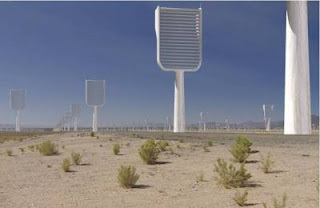 They propose low-cost, high efficiency, air extraction (carbon scrubbers). They want to use artificial trees to vacuum the atmosphere, take out the CO2, and stick it somewhere useful, such as in lagoons, where it can grow algae for $0.40/gallon biodiesel, or in hothouses, where it can boost hydroponic pot yields. If you remember Apollo 13 (The Movie), you might recall that the crisis Tom Hanks character faced was less the loss of oxygen than the oversaturation of CO2, which presented a life-threatening problem. Engineers on the ground improvised a way to join the cube-shaped Command Module canisters to the Landing Module's cylindrical canister-sockets by cannibalizing a space suit. Later space shuttles had a carbon dioxide removal system that regenerated its sorbent, leaving no wastes. The metal-oxide sorbent was cleansed by pumping air heated to around 200°C (400°F) at 7.5 scfm through its canister for 10 hours. Activated carbon, made from pyrolyzed biomass, can also be used as a low-cost carbon dioxide sorbant. Once the activated carbon is saturated the CO2 can be removed by blowing air through the bed, but that would create dirty exhaust, so a better method is to immerse the activated charcoal in a reactant like soda lime, sodium hydroxide, potassium hydroxide, or lithium hydroxide that are able to chemically react and entrain the CO2. This is similar to the process we use when mixing sawdust or chopped straw fiber with lime putty in making lime renders and plasters for natural buildings. Over time, the carbon is incorporated into the hydrated lime, leaving a hard surface, just like limestone. The scrubbers Eisenberger and Chicilnisky propose are ceramic honeycomb filters coated with immobilized amine sorbants (aminopropyl or aziridine-based sprays). Air is forced through the filters and the amines adsorb appreciable amounts of CO2 at ambient temperatures, and subsequently desorb the CO2 when temperatures are raised to 75-120°C (170-250°F). The energy to power the fans and heat the desorption process can be fossil-fueled, solar thermal, geothermal, or biomass (including Combined Heat and Biochar —CHAB— units). Using fossil fuels seems to defeat the purpose, but filters can even be installed on a coal or diesel power station and used to render the air from the smokestack cleaner than the air coming into the furnace from the sky. The specific reactant agents are a trade secret, and the group has been ramping up its business under the name “Global Thermostat LLC” of New York. At the UN event in Rio, Eisenberger and Chicilnisky disclosed that their process would extract CO2 at the rate of 2 kg/kWh-e consumed. “Aggressive operational deployment is assumed to begin in 2015, a date believed achievable given the state of the technology,” they said. They projected that by 2040, with half of all new power plants in the world adopting the technology, they could be extracting 34 gigatons of carbon dioxide per year (GtCO2/y) for the remainder of the century. Worldwide land requirement at that extraction level is put at <300 km2, about the size of Malta. Their spitball estimate of net sequestration by 2100, if all goes according to plan, is 2400 GtCO2. The “Terrifying New Math” as Bill McKibben titled his Rolling Stone piece, now takes on relevance to this discussion. McKibben says, “Scientists estimate that humans can pour roughly 565 more gigatons of carbon dioxide into the atmosphere by midcentury and still have some reasonable hope of staying below two degrees. (“Reasonable,” in this case, means four chances in five, or somewhat worse odds than playing Russian roulette with a six-shooter. )” He then points out that proven coal and oil and gas reserves of the fossil-fuel companies, and the countries that act like fossil-fuel companies, is a much larger number — 2795 Gt. If all of the proven reserves of coal, oil and gas were to be burned by 2100 (2795 Gt), and at the same time the air extraction experiment of Global Thermostat were to be scaled up as Eisenberger and Chicilnisky project (withdrawing 2400 Gt), then Earth’s atmospheric parking lot would still have space for 170 more Gt before it hits the Kyoto limit of 2 degrees of warming (2795-2400 = 395; 565-395 = 170). But, there are several reasons why this math is still fuzzy. First, there is no right answer, yet. The normal interglacial CO2 concentration is 280 ppmv, not 350 — McKibben’s target — or 390 and rising, which we have now. Methane should be at 650 ppb but instead is at 1765 ppb, 2.5 times higher than it has been for millions of years. Aiming for 350, or even just staying where we are, is probably not good enough. No one has actually seen Global Thermostat’s scrubbers in action, and likely won’t, until there is some kind of emissions cap or price attached to carbon that forces coal plants to install them. Obama’s torpedoing of the Kyoto treaty at Copenhagen and again in Cancun and Durban assures that no such cap is waiting in the wings. Neither Mitt Romney nor Obama’s nominal successor, Hillary Clinton, seem likely to go down that road as long as their financial backers remain climate deniers. Without financial incentives, neither the buyers nor the sellers have a market for carbon scrubbers. Indeed, this was the central thrust of Chicilnisky’s presentation in Rio. She wanted Hillary’s “Green Climate Fund” (more recently called the “Green Energy Fund”) to be tasked almost exclusively to air extraction technology (aka “clean coal”). $300 billion is a suitably large stimulus with which to launch her small New York LLC. We don’t really know what the Global Thermostat ceramic tree technology would cost, because we don’t know what is required to make Dr. Magic’s Patented Immobilized Amine Elixir, or how much Dr. Magic wants as a royalty for use of his patent. This month, scientists issued a new study concluding that global warming has dramatically increased the likelihood of severe heat and drought – days after a heat wave across the Plains and Midwest broke records that had stood since the Dust Bowl, threatening this year's harvest. You want a big number? In the course of this month, a quadrillion kernels of corn need to pollinate across the grain belt, something they can't do if temperatures remain off the charts. Just like us, our crops are adapted to the Holocene, the 11,000-year period of climatic stability we're now leaving... in the dust. The problem with trying to stop large scale climate change is that it may no longer be possible. We missed 150 years of warnings by Fourier, Tyndall, Arrhenius, Keeling, Broecker, Gore, the IPCC and many others. The warnings whizzed past like orange traffic cones, telling us the bridge was out, just ahead. Now we are sailing through space. We don’t know at what point we may have already triggered the shift to a new stable state, or what scientists call an attractor, that may be 5 degrees warmer than the Holocene. If we are lucky, we can land at something resembling the Paleocene-Eocene Thermal Maximum which our (reptilian) ancestors experienced 55 million years ago, lasting 200,000 years, but for that to happen, the curve of acceleration for climate forcing positive feedbacks will have to reverse, and fairly soon, and given the current state of methane clathrate bubblings, off-gassing permafrost, summer ice loss, Atlantic Conveyor retardation, and more, even that discomforting Eocene 5-degree scenario seems implausibly Pollyannaish. As we told our readers 32 years ago, there is a 25- to 50-year lag time between when we reach zero emissions and the planet stops getting warmer. Put another way, the droughts, wildfires, extreme storms, and all the other manifestations of climate change we are experiencing now, in 2012, are the direct result of the muscle car and hot rod culture of 1962. In 1962 there were 50 million automobiles and commercial air travel was in its infancy. Putting a man on the moon was a Kennedy campaign slogan. In contrast, what kind of footprint do we have today, and what kind of mark is that making on the world of our grandchildren? Rather than either embrace or reject the Global Thermostat process, we cautiously welcome air extraction as one more possibly helpful, hopefully harmless technology that could shave a few degrees off our sentence. Air extraction by no means provides a license to keep the party going, as some at the UN event may have hoped, or to burn all those proven reserves. McKibben is dead right about this — those carbon reservoirs must remain in the ground if we are to stand any chance. Air extraction, if and as it ramps up to Malta-size filtration farms by 2040, could also start pulling off radionuclides, which would be a good thing, taking us back pre-Fukushima, even to the pre-Trinity era c. 1943, when fallout referred to hair-loss. But, since no legislator has ever found a way to appropriate enough money to take nuclear waste from leaking tanks in repositories, overfilled swimming pools at reactors built on coastlines or earthquake faults, or any number of other death traps set to ensnare future generations, it is difficult to imagine spending taxpayer money on extractive radionuclide removal (never mind carbon dioxide). Will private business shoulder that burden? Show us the money. We should remember that biochar and other carbon farming techniques don’t need CO2 emissions markets or a Green Climate Fund. They improve farm yields and drought resistance independent of the speculative price of carbon. They can be entirely market driven without stimulus, right now. Our more practical strategy, as we outlined in 2006 in The Post-Petroleum Survival Guide, remains to increase climate and economic adaptability and resilience — personal, neighborhood, community and regional — while working to facilitate a transition to a saner social arrangement that promotes planetary healing. That could and should involve air extraction, and not just for carbon. We just use trees. Real ones. We need to let Gaia do what she does best. If we can just stop wounding her further, she might yet recover. She has the will to do it, although, at the moment, that happens to involve a serious and most unpleasant fever. It took us, the two-leggeds, hundreds of thousands of years of compassionate living, in the aggregate, for a stable Holocene period to emerge from the chaotic climate regimes of all preceding times. We pushed the edges of that stability with our cities, redirected rivers, man-made deserts and agriculture, but we also helped her recover, bypassing and even protecting huge expanses of rainforest and sacred, untouched mountains. The balance our predecessors struck with our mother was a delicate one, and in a mere 150 years we destroyed it, but that equipoise may not be yet beyond redemption. We just have to put the forests back and stop soiling our nest.